Learn how to play the harmonica! Did you know playing the harmonica can benefit your health? 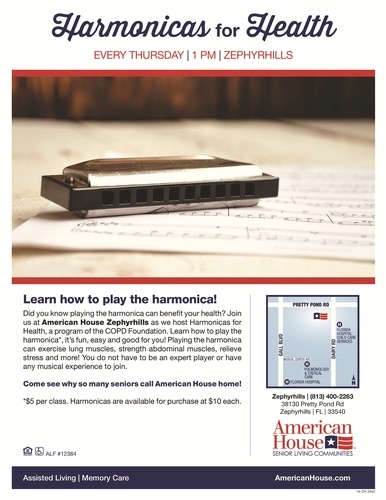 Join us at American House Zephyrhills as we host Harmonicas for Health, a program of the COPD Foundation. Learn how to play harmonica*, it's fun easy and good for you! Playing the harmonica can excercise lung muscle, strengthen abdonminal muscles, relieve stress and more! You do not have to be an expert player or have any musical experince to join. *$5 per class. Harmonicas are available for purchase at $10 each.